Brympton d'Evercy, also known as Brympton House, and the associated estate were put up for auction in 1731 and bought by Francis Fane, a barrister and Member of Parliament, for a price of £15,492. 10s. Francis Fane lived at Brympton d'Evercy for 26 years before bequeathing it to his brother Thomas, who became the 8th Earl of Westmorland. The house seems to have been left largely empty until the time of John Fane, 10th Earl of Westmorland and holder of many government offices, including that of Lord Privy Seal for thirty years. He had eloped in 1782 with Anne, his first wife, the daughter and heiress of the banker Robert Child of Osterley Park. Child, incandescent with rage, followed the coupe as far as Preston, where he actually shot one of the eloping couple's carriage horses. Even this failed to stop them but one of Westmorland's coachmen cut loose the horses of Child’s carriage thus enabling the couple to reach Gretna Green and marry before Child could apprehended them. They had at least four daughters. In 1800 he took as his second wife Jane Saunders, a lady so wildly eccentric that she was described by Charles Fox as ".... perhaps not mad, but nobody ever approached so near it with so much reason". The Countess decided to shock conventional society and leave her husband, taking their first child (his fifth daughter) Lady Cicely Jane Georgiana Fane, known as Lady Georgiana, with her. This unconventional pair of ladies set up home at Brympton d'Evercy. Lady Georgiana Fane inherited the Preston estate, together with half of Prince Edward Island in Canada, which she inspected personally. Lady Georgiana, like her mother, was apparently of a 'lively' disposition but her chief claim to fame was her relationship with Arthur Wellesley (1769-1852), the 1st Duke of Wellington. Lady Georgiana first met Wellington just after the Battle of Waterloo in 1815, when she danced with him at a ball in Paris - she was aged 14, he was 46. In her twenties, she became friendly with Lord Palmerston, who apparently proposed marriage to her. However she declined Palmerston and instead turned her attention once again to Wellington. During her twenties their relationship turned into a romance lasting over twenty years, although Wellington was married. Lady Georgiana was highly strung, possibly to the point of neurosis - when she features in the memoirs of her cousin, Lady Arbuthnot, Wellington’s confidante, she is often described as being chronically ‘ill’ and at one point Arbuthnot suspects that her indisposition was ‘almost entirely nervous’. Wellington's wife, Kitty Pakenham, died in 1830. By this time Lady Georgiana was 29 and Wellington was 61. But now she found that she had to compete with a plethora of high ranking ladies, both married and unmarried, who were keen to secure the eligible widower for themselves. Possibly because he felt uncomfortable about the increasingly persistent tone of her letters to him, Wellington decided to break off his relationship with Lady Georgiana. However, when he ended the relationship she tried to sue the Duke for breach of promise to marry her and threatened to publish some of his love letters which, by the strict moral standards of the day, would have caused a national scandal. Charles Greville, the political diarist, recounted "The Duke of Wellington has got himself at 82 years of age into, if not a scrape, an embarrassment, with Lady Georgiana Fane who is half-cracked. It seems that he has for some years past carried on a sort of flirtation with her and a constant correspondence writing her what might be called love letters and woefully committing himself. He has now broke with her and she persecuted him to death she is troublesome and he is brutal and will not see her or have anything to do with her. She tries to get at him, which it seems she can only do as he comes out of Church (early service) at St James, and she makes a scene here not long ago. She says all she wants it that he should behave kindly to her, which is just what he will not do. Meanwhile she has placed his letters in the hands of her solicitor, Mr Frere (an outrageous thing) who tells her they are sufficient to establish a case against him for breach of promise of marriage. Nothing of this queer but lamentable affair seems to have got out, and for the credit of the Duke it is hoped it may not. It would be painful to see him an object of ridicule and contempt in the last days of his illustrious life. My mother told me the story. She had it from Lady Georgina Bathurst to whom Lady Georgiana Fane herself told it and showed her the Duke's letters wanting her to get the Duchess of Gloster to read the, who however, declined to do so. He has always had one or more women whom he liked to talk to, but the strangest of all his fancies was this tiresome troublesome crazy old maid." 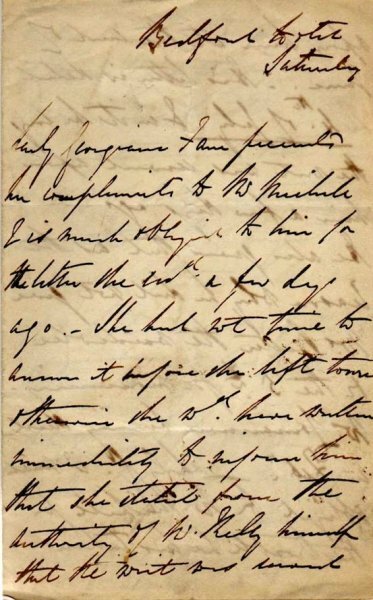 Although the affair was hushed up, a letter from the Duke of Wellington to Georgiana's mother the Countess was discovered in 2002 at Fulbeck Hall, Lincolnshire, (the home of the Fane family for more than 400 years). The letter implored the Countess to persuade her daughter to stop molesting him with letters. It began "My dear Madam.... I have long had it in contemplation to appeal to your Ladyship and to request your Ladyship's interference with your daughter Lady Georgiana Fane to prevail upon her Ladyship to cease to molest me with daily vituperative letters." Referring to the allegation of his breach of promise, the Duke continued: "Your Ladyship is mistaken or rather you have been misinformed, there is nothing of the nature of a misunderstanding between us." Wellington died not long after he wrote the angry letter to Fane’s mother. In her Land Tax Assessment of 1844, her address was given as Upper Brook Street, St George Hanover Square, London. She was still living there in 1865. Lady Georgiana's mother, the Countess, died 26 March 1857 and Lady Georgiana lived on as the sole chatelaine of Brympton. She never married. Lady Georgiana had strong, if wrong, opinions about Preston Plucknett. Convinced that her lands had once been monastic property she considered she should not pay tithes on the estate. First she changed the name of Preston Great Farm to Abbey Farm, since, she said, if it had not belonged to the Bermondsey Priory then it had been owned by the Convent of the Blessed Virgin Mary and St Bridget of Syon, Middlesex, since this House had held the Rectorship of Yeovil (with Preston) from 1418 to 1545. She started proceedings against the Tithe Commissioners to prove her point. She spent a fortune on lawyer's fees and after five years lost the case. The Farm had never been Abbey property, but the name has survived. Lady Cicely Jane Georgiana Fane died on 4 December 1874, leaving the heavily indebted estate to her nephew the Hon. 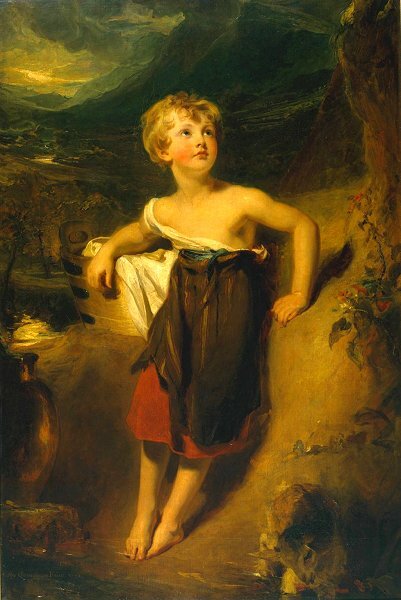 Spencer Ponsonby, younger son of the 4th Earl of Bessborough. Her will was proved on 26 December and her effects estimated at "under £25,000" (just under £18 million at today's value). The following are the Preston land holdings of Lady Georgiana Fane as listed in the Preston Plucknett Tithe Apportionment of 1848. Her total holdings in Preston Plucknett were over 410 acres (the total acreage of the parish was 844). This portrait of Lady Georgiana was painted around 1806 while the artist, Sir Thomas Lawrence, was working on two conventionally grand and sober portraits of her father. It shows the peer's daughter as a peasant child with a tub of laundry beside a stream, accompanied by a pet kid. This playful conceit may have been devised by her famously witty, not to say eccentric, mother. Lady Georgiana bequeathed the picture to the national collection on her death in 1874. This letter from Lady Georgiana dates from 15 September 1839, and though it does not appear to touch on the Wellington issue, manages to give a flavour of her peculiarly obsessive character. Written in the third person (in itself a sign of egotism) it is addressed from the Bedford Hotel to someone (perhaps a lawyer) who is helping her recover a debt. There are mentions of a writ being served and a rather querulous tone that underpins the polite language. 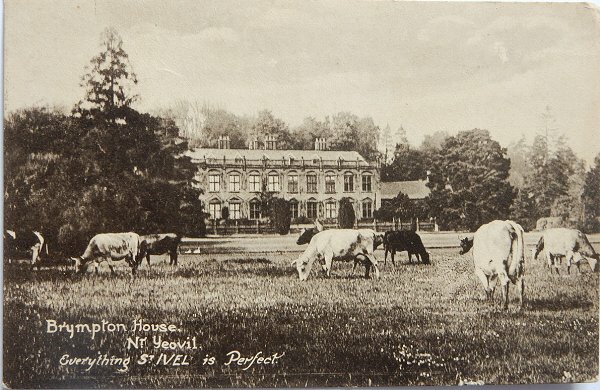 The first of two postcards in Aplin & Barrett's St Ivel advertising series featuring Brympton House, the home of Lady Georgiana Fane. 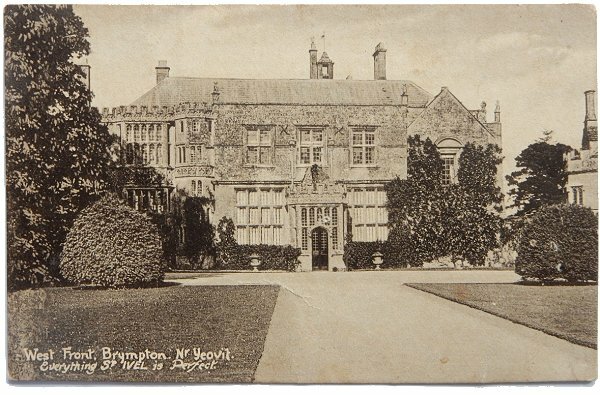 .... and the second Aplin & Barrett postcard featuring Brympton House. 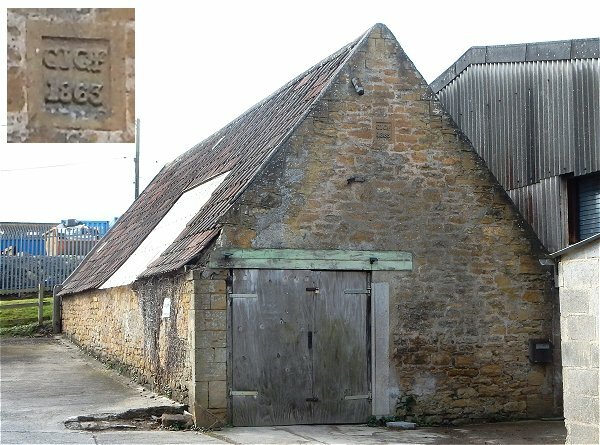 An old farm building with a date stone in the gable (see inset) of 'CJGF' over 1863 which stands for Lady Georgiana Fane's full name - Cicely Jane Georgiana Fane. Photographed 2016.